Cacio e Pepe is an easy and delicious Italian meal made with cheese & pepper. This healthier version is lightened up by replacing wheat noodles with roasted spaghetti squash. It’s a fast and flavorful low-carb dish that’ll certainly satisfy your pasta cravings. With just five wholesome ingredients, Cacio e Pepe is one of the quickest Italian meals to make. Pasta noodles are tossed with high-quality olive oil, aged Pecorino Romano cheese, salt, and generous amounts of freshly cracked black pepper. A comfort food recipe the whole family will enjoy. If you’re craving pasta but looking for a more vegetable-packed option, give spaghetti squash a try. Roasting halves of spaghetti squash make tender pasta-like strands for faux noodles. It’s a wholesome and gluten-free option that’s loaded with nutrients per serving. This delicious low carb version of Ccacio e Pepe is from Gina Homolka’s mouth-watering cookbook Skinnytaste One and Done : 140 No-Fuss Dinners for Your Instant Pot®, Slow Cooker, Air Fryer, Sheet Pan, Skillet, Dutch Oven, & More. Gina is the genius behind Skinnytaste.com, and I had the honor of meeting her at a conference in Salt Lake City. I was immediately impressed by her passion for developing craveable healthy recipes that home cooks can make with ease. When Gina told me about her latest cookbook project that involved 140 no-fuss dinners using popular kitchen appliances and basic kitchen equipment, I was very intrigued! Flipping through the pages, I practically bookmarked every recipe I saw. You’ll be inspired by the gorgeous photography, diverse cuisines, and plentiful options to use different cooking methods and tools. The layout is styled for maximum user experience while the recipes are designed with your wellness in mind. I recently became obsessed with cooking spaghetti squash and using it to substitute pasta in my meals. This vegetable is a nutrient powerhouse, giving a boost fiber, protein, vitamin A, C, potassium, and magnesium. It’s also low in calories, fat, and carbohydrates, making it a guilt-free food. To enhance the flavor, roasting the squash in a hot 400-degree oven allows the flesh to tenderize and brown on the edges, making each forkful tastier. Following Gina’s recipe, simply cut the squash in half lengthwise, season with a pinch of salt and pepper, and roast cut side down. It takes about an hour for the flesh to become tender, but it’s an easy method that doesn’t require much attention once it’s in the oven. Once the spaghetti squash is cooked, grab a fork to scrape the flesh from the skin and watch how it turns into angel-hair-sized pasta strands as it separates! For this recipe, I love Gina’s recommendation for Pecorino Romano cheese at it has a pleasant nuttiness and a sharp flavor from the sheep’s milk. It may be replacing ALL my wedges of Parmesan that I have stocked in my fridge. To finish the dish, just toss the pasta in extra-virgin olive, top with a hearty coating of freshly grated cheese, then season with salt and a generous amount of ground black pepper. If you’re a newbie to the Instant Pot or air fryer, this cookbook is definitely a must-have. You’ll appreciate Gina’s level of detail and instructions using alternative cooking methods on some of her recipes. 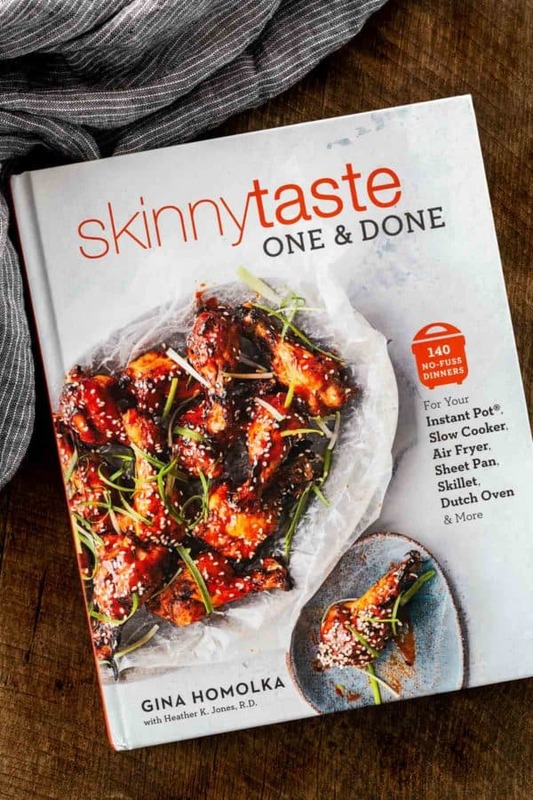 The book also features nutritional information and a recipe key to highlight which ones are quick, vegetarian, gluten-free, dairy-free, or freezer-friendly. I look forward to eating my way through the rest of Gina’s beautiful cookbook and I know you will too. Heck, she inspired me to buy an air fryer! If you’re looking for healthy dinners that are a breeze to prepare, this cookbook is a worthy addition to your collection. To yield the longest strands, cut the squash into 1-inch sized rings and then roast. Use a fork to carefully lift and separate the strands from each ring. Cutting the squash in half lengthwise creates shorter strands, but are easier to remove with a spoon or fork, plus you can eat straight from the squash “bowl”. Low carb version of Italian Cacio e Pepe recipe that is lightened up by substituting roasted spaghetti squash for pasta noodles. Preheat oven to 400ºF. Line a large baking sheet with foil. Halve the spaghetti squash lengthwise and use a spoon to scrape out the seeds and stringy yellow strands, then discard. Season the flesh with a pinch of salt & pepper then place the squash cut side down on the prepared pan. Bake until the flesh can be easily pierced with a fork, 55 to 60 minutes. Remove the pan from the oven and let cool for 10 minutes. Using a fork scrape out the squash flesh into a bowl; it will separate into spaghetti-like strands. Add olive oil, Pecorino Romano, and 1/2 teaspoon black pepper. Toss well and serve immediately. Garnish with more cheese and pepper as desired. This looks delicious…gotta try it sometime. I’ve not been a big spaghetti squash fan, but I really think I may have not cooked it as long as needed. I was hoping this was one of yours (I am looking for your cookbook to arrive today (!) and I’m quite excited to see it). But I’ll get this one into my Recipe Keeper, and definitely give it a try. I made this dish about a month ago and it was AMAZING!! new month and making it again. Thank you for sharing. You’re so welcome! So happy to hear that you enjoyed the recipe. I hope you try more from SkinnyTaste cookbook too! Using a WW calculator, the freestyle points come out to 16 per serving. When calculating using just the ingredients, it comes out to 6 freestyle points per serving. The nutritional data seems to be incorrect. Please confirm. The carbs alone seems off. Hi Pat- I’m not familiar with the WW points, but let me know if the carbs look closer to what you’re getting. Thanks!